The AirLink101 SkyIPCam777W combines all the functionality of a camera security system into one unit at an affordable price. It is an excellent product. We found the setup and use of the camera very intuitive. The Smart Wizard can easily guide you through the initial setup, but you'll need to be versed in some networking concepts from that point. You can use the included viewer software to do the camera management, but the web page works just as well and also works in all environments. We also tried the 3GP stream from the camera. Other than the low resultion, the picture was good enough to see what's going on from your mobile phone. We used a Blackberry Storm and it was finicky. Sometimes we had to disable the audio on the stream for it to work. A better mobile client would probably be fully supported. This SkyIPCam777W is fully usable with a DVR solution like Zoneminder. Zoneminder can grab the MJPEG feed and there are scripts to control the pan/tilt controls. Even if you don't use a full fledged DVR security solution, the camera itself can do nearly everything on its own. It truly is a featured packed unit. Just remember to have a Windows PC handy for setting up the motion trigger on the camera. That is the most useful feature, by far. We did have some concerns over the manufacturer, though. When we went to visit their website for updates, it was offline due to the domain being expired. This happened for about a day until it came back up. It might be an oversight, but you should keep that in mind when buying it. You might not get any support (even though there is right now) in the future. Another issue is the lack of auto focus. Without it, the camera can only see a certain distance. This makes the pan/tilt functionality a bit less useful. In addition, since the camera only takes VGA (640x480) video, you can't easily enlarge an image which would mitigate the auto focus problem. Still, these issues are minor in the home based security segment this is targeting. This is an example snapshot done by using the motion trigger event. It was saved to a USB flash drive. You can easily see enough detail to perform a useful analysis of the scene. The camera does capture snapshots very well. This is at VGA resolution, as well. The same motion triggered event was saved to additional NAS storage with a video. This is the raw footage from the camera. It contains well enough detail to see what happened. While trying to be sneeky, someone walked into the room and took something (an SSD). The Editor-in-Chief strikes again in this video review. It is a good suppliment to better understand how the camera works. Please leave us some comments on Youtube or in the forums to let us know how the videos are doing. The AirLink101 SkyIPCam777W retails for about $160 at Geeks.com. For a unit that incorporates nearly all functionality you'll need for a home security solution, this is an excellent price. The camera nearly works in all computing environments. Once it is setup, you'll rarely have to check up on it again. You can send yourself email videos or snapshots and even view videos from your mobile phone. This camera is really a jack of all trades. We're very impressed with the amount of features you get for the price and we recommend the unit if you want a security solution. Sure, there are many better IP cameras, but most won't be at this price and won't offer the range of features included with this camera. If you need a home security camera solution, look no further than the AirLink101 SkyIPCam777W. It works really well and gets the job done. 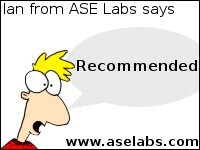 ASE Labs would like to thank Geeks.com for providing this product for review.